Selling energy drinks to minors will soon be illegal in Lithuania, as the parliament voted overwhelmingly to ban highly caffeinated beverages to people under the age of 18. Lithuania is the first EU country to enact such a ban. The ban, which includes non-alcoholic beverages containing more than 150 milligrams per liter of caffeine, will take effect in November. It also applies to beverages containing a range of stimulants like guarana, ginsenosides, glucuronolactone, and taurine. While considering the measure, the Baltic state’s government cited health concerns, stating that a high concentration of caffeine may lead to addiction and hyperactivity. Citing scientists, the parliamentarians also stressed that it may encourage youngsters to try drugs. “It is wrong to think that these restrictions could be conducive to improving business conditions. It will trigger significant chaos and huge costs,” liberal lawmaker Eugenijus Gentvilas said. In addition, critics have pointed out that coffee also contains caffeine, stressing that energy drinks aren’t the only culprit. “I’m not sure which products fall into the definition; it is not only energy drinks, but coffee,” local 15 min. lt news portal quoted a member of the liberal movement Remigijus Simasius. “Taurine is now put not only in drinks but in chewing gum, chocolates, and candies too,” another opponent told the news portal. MP Alma Monkauskaite objected to the arguments, saying that energy drinks contain up to ten times more caffeine than coffee. “It is important to public health, even though a bit of a disruption to business,” she said, according to balsas. lt website. ... Because caffeine is a stimulant -- consuming a lot of it can lead to heart palpitations, anxiety and insomnia -- it also can make you feel jittery and irritable. Over time, caffeine can become addictive. It is also a diuretic -- it causes the kidneys to remove extra fluid into the urine. That leaves less fluid in the body. so drinking an energy drink while you're exercising can be particularly dangerous. The combination of the diuretic effect and sweating can severely dehydrate you. Many people mix energy drinks with vodka or other alcohol to make a high-energy cocktail. Since alcohol is a depressant, it has a tranquilizing effect on the body that can make you unaware of how much you're drinking. One study found that men who combined energy drinks with alcohol felt alert and sober, even though they were actually drunk. And since both alcohol and energy drinks dehydrate you, when combined they can cause your body's fluids to drop to dangerous levels. In 1991, two people in Sweden who drank alcohol with an energy drink reportedly died of dehydration, although it was never conclusively proved that the energy drink led to their deaths. Other ingredients can also be problematic. For example, the stimulant ephedrine, an ingredient in many decongestants, can cause heart problems. In 2001, two California high school students fainted after ingesting energy drinks containing ephedrine. Because very little research has been done on the long-term health effects of consuming excess amounts of taurine and other ingredients in energy drinks, many health experts advise pregnant women and young children to avoid them. Red Bull is one of the most well-known brands of energy drinks out there. RED BULL BANNED! Red Bull may be the best selling energy drink in the United States, but it isn't so popular in other countries. In 2000, the French government decided to ban Red Bull after the brand was linked to the death of an 18-year-old Irish athlete. The teenager died after drinking four cans of Red Bull at a game. French laws dictate the maximum amount of caffeine that companies can add to products, and Red Bull exceeds that limit. Denmark and Norway have also banned the drink. Other countries, such as Canada, require the can to carry a warning label for pregnant women and children. 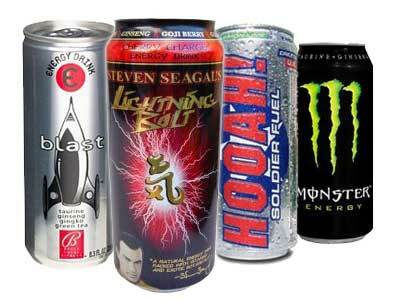 Energy drinks are supposed to do just what the name implies -- give you an extra burst of energy. As it turns out, most of that "energy" comes from two main ingredients: sugar and caffeine. A typical energy drink can contain up to 80 milligrams of caffeine (about the same amount as a cup of coffee). By comparison, a 2006 study found that the average 12-ounce soda contains 18 to 48 mg of caffeine. Other than caffeine levels, how do energy drinks differ from sodas and sports drinks? Soft drinks are mainly water, sugar and flavoring. They don't do anything for your body; they're just supposed to taste good. Sports drinks are designed to replenish fluids lost during activity. They typically contain water, electrolytes and sugar. Energy drinks have added caffeine and other ingredients that their manufacturers say increase stamina and "boost" performance. They're designed for students, athletes and anyone else who wants an extra energy kick. Energy drinks became popular in Asia long before they reached the United States. In 1962, Japanese pharmaceutical company, Taisho, released its Lipovitan D drink. It was designed to help employees work hard well into the night. Lipovitan D contains taurine, the same ingredient found in many of today's energy drinks. The very first "energy" drink to reach the United States wasn't really an energy drink at all -- it was more of a hyped-up soft drink called Jolt Cola. The "jolt" in the cola was a lot of added sugar and caffeine. Introduced in the 1980s, Jolt Cola quickly became a staple of college campuses. Jolt Cola, the first "energy drink," came out in the 1980s and has remained popular with college students. An Austrian businessman named Dietrich Mateschitz picked up on the cash potential of energy drinks while on a business trip to Asia. Along with two Thai business partners, Mateschitz started the company Red Bull GmbH, with the idea of marketing the drink to young Europeans. Many clubs on the American West Coast caught wind of the Red Bull phenomenon and began importing it to sell as a cocktail mixer. Red Bull began distributing its drink in the United States in 1997. According to its manufacturer, revenues doubled each year, reaching more than $1 billion in 2000. Although Red Bull has consistently been the leader in the energy drink market, several other companies have launched their own energy drink lines. Many of them are endorsed by celebrities. Ephedrine - A stimulant that works on the central nervous system. It is a common ingredient in weight-loss products and decongestants, but there have been concerns about its effects on the heart. Taurine - A natural amino acid produced by the body that helps regulate heart beat and muscle contractions. Many health experts aren't sure what effect it has as a drink additive (and the rumor that taurine comes from bull testicles is false). Ginseng - A root believed by some to have several medicinal properties, including reducing stress and boosting energy levels. B-vitamins - A group of vitamins that can convert sugar to energy and improve muscle tone. Guarana seed - A stimulant that comes from a small shrub native to Venezuela and Brazil. Carnitine - An amino acid that plays a role in fatty acid metabolism. Creatine - An organic acid that helps supply energy for muscle contractions. Inositol - A member of the vitamin B complex (not a vitamin itself, because the human body can synthesize it) that helps relay messages within cells in the body. Ginkgo biloba - Made from the seeds of the ginkgo biloba tree, thought to enhance memory. Looking at the ingredients, energy drinks appear to be part soft drink and part nutritional supplement. According to reviewers, the taste falls within the same range. People who have tried energy drinks have described the taste as ranging from "medicinal" to "molten Sweet Tart." Caffeine works by blocking the effects of adenosine, a brain chemical involved in sleep. When caffeine blocks adenosine, it causes neurons in the brain to fire. Thinking the body is in an emergency, the pituitary gland initiates the body's "fight or flight" response by releasing adrenaline. This hormone makes the heart beat faster and the eyes dilate. It also causes the liver to release extra sugar into the bloodstream for energy. Caffeine affects the levels of dopamine, a chemical in the brain's pleasure center. All of these physical responses make you feel as though you have more energy. There are hundreds of energy drinks on the U.S. market, but most of them contain very similar ingredients. I’ve issued repeated warnings about the hazards of drinking too much sports and energy drinks. They are bad for your teeth. Really bad! But now a new scientific study proves what I’ve been warning parents about for years – sports and energy drinks can start to destroy teeth after only 5 days! as little as 5 days. The researchers found that damage to enamel was evident after less than a week of exposure to sports or energy drinks, although energy drinks showed a significantly greater potential to damage teeth than sports drinks. In fact, scientists found that energy drinks caused twice as much damage to teeth as sports drinks. If you are thirsty? Reach for your water bottle instead. The young, athletic Lanna Hamann, 16, drank a Red Bull energy drink on the sunny beach of Rocky Point and went into cardiac arrest on June 14. Her crying mother told reporters: ‘This is something that could have happened anywhere. We've heard for years that mixing alcohol and energy drinks can raise your blood pressure and heart rate, causing a number of deaths. But, it's becoming clearer that you don't have to mix your Rockstar or Monster with vodka for your drink to be deadly. Tragic case in point: Lanna Hamann, a 16-year-old girl from Arizona, was on vacation with her friends in Mexico when she died of an apparent heart attack. According to her friends, Hamann was drinking Red Bull that day; friends and family believe that Hamann's Red Bull habit was responsible for her death. In the days that followed, Hamann's friends sprung into action. First, they created a GoFundMe page to finance the transport of her body back from Mexico, as well as her burial, raising over $15,000 in three days. Not only that, but they've also taken to Twitter, using the hashtag #getlannahome to both promote the GoFundMe campaign and to pressure Red Bull to take responsibility and support Hamann's parents. As of this writing, Red Bull has not responded to the movement directly. However, they provided a statement to Time, saying that the company's "sympathies are with the Hamann family and are unable to comment on this particular situation."